HiFi Stereo Turntables - Direct Drive + Belt Drive + USB Turntables 33 + 45 RPM  16 +78 RPM Turntables HERE! As turntables require to be hooked up to othe requipment, such as an amplifier and speakers, to produce sound, Hi-Fi turntables are equiped with the needed output to record or archive records for play back on another medium. Most turntables come form a time aeara when 16 or 78 RPM records were considered obsolte. 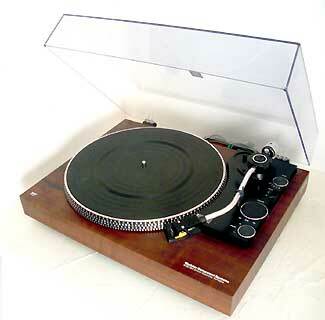 Thus most turntables provide only platter speeds and stylie for 33 and 45 RPM . To play transcription records or 78 shellac records would require special modifications (which I am proud to provide for many turtnables! - Please inquire) - And: specialty stylie to play records, other than LPs and Singles will be needed. For 78 and 16 RPM capable turtnables and record players see my "Custom Modified" Turntable and Record Player sections. Turntables that allow to stack records for autmated uninterupted continuous play, so that one would not have to get up, to change the record, are considered RECORD CHANGERS and thus can be found in my Record Changer section. Direct Drive Turntables - the platter is driven directly by a motor instead of usign transfer devices such as a belt or an idler wheel. Linear Tracking Turtnables - instead of having a tone arm that pivots around a central point: the tone amrm itself is moved so that the stylus always plays in line with to the record groove to avoid paying at an angle. Note: this unit can also be custom modified to 3 or 4 speed (16, 33, 45,78) at additional cost: $400 range total Or: substitute aspped (eg. 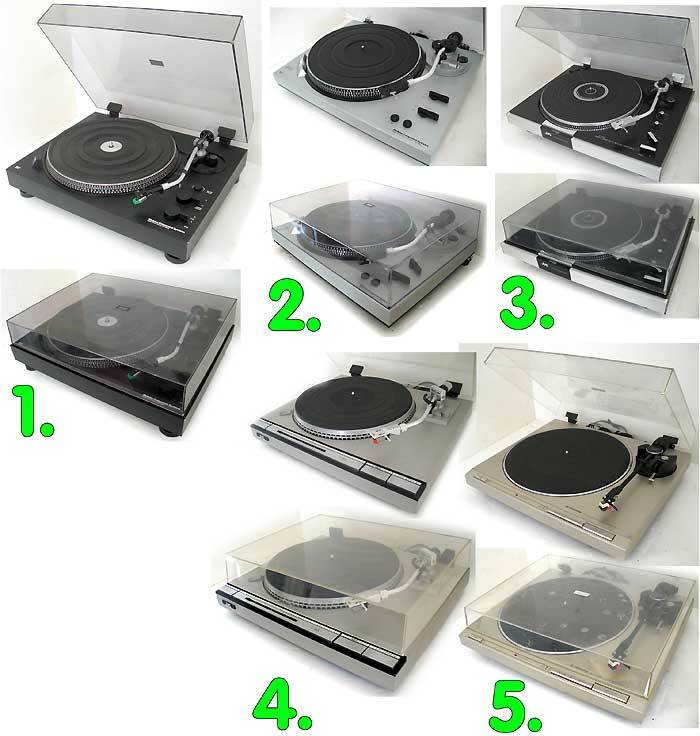 to play 16 + 33 RPM) - adds $150 -Inquire 16 +78 RPM Turntables HERE!  Amplifier has phono input: ceramic / phono magnetic switchable! Description: MCS turntables were actually manufactured by Technics and use the exact same mechanical and electronic parts inside. This turntable was made in the late 70's in Japan and is a well made quality piece of audio gear. A fine but yet kept simple turntable with auto-retun. It is excellent condition and it's mechanicanism and electronics were refurbished to provide long term reliable operation. Perfect to listen to those records again, or transfer them to digital! Features: S-tone arm, gentle lift oil dampened cuing mechanism, physical features: strobe ring with neon light for 33 and 45 RPM at 50 and 60 Hz (to allow acurate pitch adjustments), Pitch control, separate for each speed. Counter weight and anti scating adjustments. Outputs: cable with RCA jacks and ground wire. Condition: Excellent, very clean works nicely as recently refurbished. Clean appearance with only minor and few light scratches on the dust cover. Work performed (to present this unit in perfect and reliable working condition: Deoxydization of all controls and switches. Performed adjustments. Reliable operation for decades to come! Physical cleaning and detail work. OR: Quick Check Out Shopping cart button below = about $240 total ($185 + about $55) =$65 Shipping DEPOSIT to purchase this turtnable for $175 plus hsipping. Shipping Cost Overpayment refund when actual shipping cost calculated). Payment processed through PAYPAL. With Payment I will: pack, then calculate actual shipping cost to your ZIP code (within continental USA only! ), refund the shipping cost over payment (if any), SHIP and e-mail tracking number. Restrictions apply - so: I may cancel this purchase and refund. If need to approve shipping costs, before I ship, please use: Buy/Inquire instead. Please READ and agree to All details before proceding here. Description: This may not be the most exciting turntable to look at, but I prefer the technology used in it over other direct drive turtnables. Sony had always their own way of doing it and what was implemented here makes asense to me: There is a magnetic signal recorded on the inside of the platter and a playback head that reads that signal. This means: the actual rotation speed is read at the most outside point, which translates to accurate and fast speed control. And thus I have experienced this turtnable as the one with the most stable speed. Other than that: tone arm and othe rparts are precision crafted to tight specs as well. in plain words: I consider this a precision quality direct drive turtnable and excellent value for it's price range. Work performed (to present this unit in perfect and reliably working condition: De-Greased, cleaned and re-lubricated mechanical parts! De-oxydized all swqitches, trim pots with quality contact cleaner. Checked and tweaked adjustments. Due to defective: replaced cartridge with one of the same type, made by Grado, used the original stylus, which is good used. Physical cleaning and detail work. 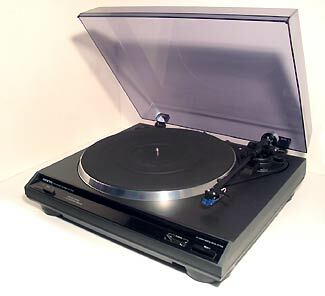 Lot: 1 SONY PS-LX2 semi-automatic direct drive turntable as described and shown above, includes good used stylus. Note: this unit can also be modified to 3 or 4 speed (16, 33, 45,78) at additional cost: $325-$400 range total - inquire. 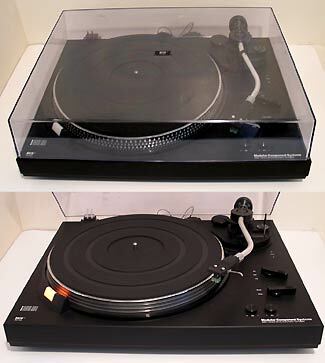 - OR: Quick Check Out Shopping cart button will bill you about $250 total ($195 + about $55) = $75 Shipping DEPOSIT) to purchase this turntable for $175 plus shipping without addtional modifications. Payment processed through PAYPAL. With Payment I will: pack, then calculate actual shipping cost to your ZIP code (within continental USA only! ), refund any shipping cost over payment, SHIP and e-mail tracking number. Restrictions apply - so: I may cancel this purchase and refund. If need to approve shipping costs, before I ship, please use: Buy/Inquire instead. Please READ and agree to All details before proceding here. Description: This is a ruggedly made Direct Drive tutnable form the 70's. I prefer the technology used in by Sony over other direct drive turtnables: There is a head underneath the platter that reads the actual speed to feed to the regulation circuitry for very acurate and stable speed. I consider this a precision quality direct drive turtnable and excellent value for it's price range. Note: No dust covever included - sold at a reduced price because of it. Condition: Technically sound: recently overhauled and fully tested - see "work perfromed" below. Physical: Tunrtable Excellent condition. Clean with unavoidable sings of use! Clean but typically unavoidable signs of use. For example: the reject button has a section wher ethe metal lamintte is imperfect (see photo) No Dustcover. The unit looks nice - Can e-mail larger un-compressed images, if wanted! Work performed (to present this unit in perfect and reliably working condition: De-oxydized all swqitches, trim pots with quality contact cleaner. Repair the arm rest lock. Checked and tweaked adjustments. Physical cleaning and detail work. More Driect Drive Turntables Below at Bottom of Page! 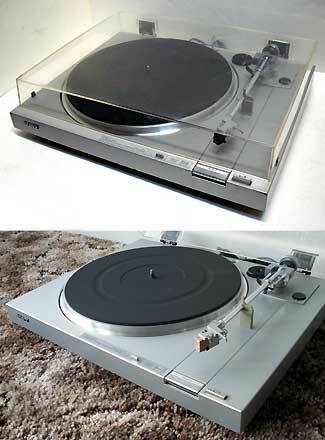 Lot: 1 SONY PS-T-1 semi-automatic direct drive turntable as described and shown above, includes new stylus. This turtnable did not come with a dust cover - perfect for installation in phono furniture. I have a dust cover form a BIC turtnable that fits the size. Note: this unit can also be modified to 3 or 4 speed (16, 33, 45, 78) at additional cost: $400 range total - will replace cartridge with a 78 RPM compatible cartridge as well - inquire. Price: $115.00 without a dust cover, or $145.00 with the BIC dust cover as shown in the photo. Dust cover deos not have hinges. Dust cover was damaged - glued back together and has other defects. - OR: Quick Check Out Shopping cart button to purchase this turtnable for $115 (without dust cover) plus shipping. This will bill you about $180 total ($135 + about $55) = $115 for the turtnable + $65 Shipping DEPOSIT) Payment processed through PAYPAL. With Payment I will: pack, then calculate actual shipping cost to your ZIP code (within continental USA only! ), refund any shipping cost over payment, SHIP and e-mail tracking number. Restrictions apply - so: I may cancel this purchase and refund. If need to approve shipping costs, before I ship, please use: Buy/Inquire instead. Please READ and agree to All details before proceding here. Description: This turntable is form a time before plastic was used as the main component: The base of this unit is a vinyl covered wood base. Obviously a finer turntable. This unit was fully re-worked: new belt, re-lubricated. Refurbihsed electronics control board. 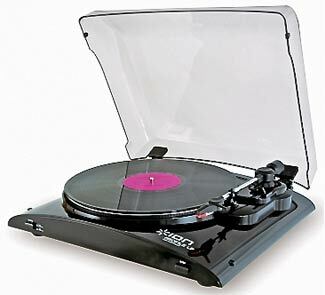 Get luxurious rugged and stylish well working and great sounding quality turntable. Today they just don't make 'em like that anymore. A quality instrument and worthwhile investment. Condition: Technically sound: recently overhauled and fully tested - see "work perfromed" below. Physical: Tunrtable good condition, with the usual unavoidable signs of use - will be glad to e-mail detail pictures. Dustcover: scratches and dings - left front corenr broken out. The unit looks presentable - the photo as with all of my photos shows the actual item. Work performed (to present this unit in perfect and reliably working condition): Cleaned and re-lubricated mechanical parts + motor. De-oxydized control, switches and trim pots and refurbished the electronic control circuit (all electrolytivc capacitors new! ), replaced the drive belt and the stylus. Physical cleaning and detail work. Lot: 1 Marantz 6200 fully automatic belt driven turntable as described and shown above, includes new stylus in. - OR: Quick Check Out Shopping cart button to purchase this turtnable for $349 plus shipping. This will bill you about $414 total ($349 for the turtntable + $65 Shipping DEPOSIT) Payment processed through PAYPAL. With Payment I will: pack, then calculate actual shipping cost to your ZIP code (within continental USA only! ), refund any shipping cost over payment, SHIP and e-mail tracking number. Restrictions apply - so: I may cancel this purchase and refund. If need to approve shipping costs, before I ship, please use: Buy/Inquire instead. Please READ and agree to All details before proceding here. Description: MCS turntables were actually manufactured by Technics. 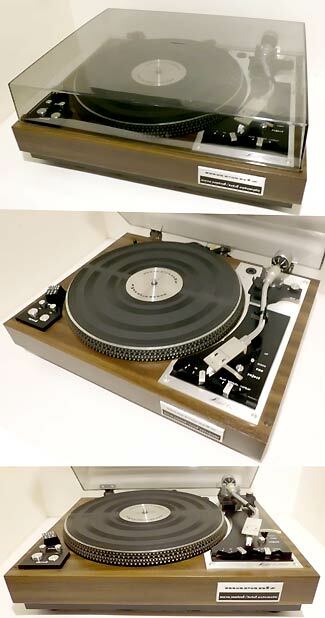 This turntable was made in the late 70's (1979). Technics is and always has been a name for quality. This Hi-FI stereo turntable was constructed with a wooden base - Wood is preferable because of it's sonic propperties and appealing look. Features: S-tone arm, gentle lift oil dampened cuing mechanism, physical features: strobe ring with neon light for 33 and 45 RPM at 50 and 60 Hz (to allow acurate pitch adjustments), Ppitch control. Motor control knob: 33, OFF, 45. Counter weight and anti scating adjustments. Outputs: cable with RCA jacks and ground wire. Condition: Excellent, very clean works nicely as recently refurbished. Clean appearance with only minor and few medium scratches on the dust cover. There is one shortcomming: The dust cover does not stay up and needs to be held when changing the record. Work performed (to present this unit in perfect and reliable working condition: Replaced the drive belt and installed cartridge, cleaned all drive parts. Lubrication work. Deoxydization of all controls and internal trimmer potentiometers, switches and contacts.Performed adjustments. Reliable operation for decades to come! Physical cleaning and detail work. Description: This is a circa 1988 Onkyo hi-fi turtnable. Onkyo is and always has been a name for quality and this Hi-FI stereo turntable even while kept simple this model is no exception. A fine but yet kept simple turntable with auto-retun. It is excellent condition and it's mechanicanism and electronics were repaired and then refurbished to provide long term reliable operation. Perfect to listen to those records again, or transfer them to digital! Features: gentle lift oil dampened cuing mechanism, Speed selector switch: 33, 45. Stop button, Counter weight and anti scating adjustments. Outputs: cable with RCA jacks. Condition: Excellent, very clean works nicely as recently refurbished. Clean appearance with only minor and few medium scratches on the dust cover. Work performed (to present this unit in perfect and reliable working condition: Repaired a problem in the power supply; Replaced the drive belt and stylus, cleaned and lubricated all drive parts. Performed adjustments. Reliable operation for decades to come! Physical cleaning and detail work. Lot: 1 Onkyo model: CP-1116A Turn Table with with empire cartridge and used stylus Note: this unit can also be modified to 3 or 4 speed (16, 33, 45,78) at additional cost. $350 range total. Or a speed substituted: for example 16/33 RPM for an aditional $100 - inquire. Description: ION Conversion Turntable / Record Player to convert Vinyl To Mp3 by direct connection to a Mac or PC computer via USB. Software Included. Features: A complete Vinyl conversion system: Includes the turntable, connection cable, Software CD and cables. Re-discover your vintage Vinyl records by brining them into the digtal age. USB output and USB cable AND: Outputs cable with RCA jacks. More 16 and 78 RPM Turntables - HERE! Condition: New - Unused. Box has been opened, but all items appear still in original wrapping / packing - never unpacked. Lot: 1 New and complete (unused) ION model: Profile LP USB Turn Table with Softwared CD, user Manual, USB cable, New Stylus, Platter mat and dust cover. Note: this unit can also be hardware modified to 3 or 4 speed (16, 33, 45,78) at additional cost. Or a speed substitution can be implemented: for example replace 45 RPM with 16 RPM or replace 45 RPM with 78 RPM starting at an aditional $100 - inquire. While software converison to correct 16 or 78 RPM records played at 33/45 works, it is not ideal. AND: it shall be noted that for playing 78's a wider stylus is need (78 sylus - I can provide) or damage to record and the stylus likely to occur. If risking damage to the records / stylus by playing 78's with a LP stylus: the sound quality is poor, as extra noise will be introduced by a too narrow stylus riding in a groove that is too wide for it. AND: if the record is recorded while spinning at the correct speed, the sound quality is better versus derived by software conversion. If wishing to purchase any of these items in original "AS FOUND" condition: Please make me an offer high enough at which I absolutely cannot refuse to sell. If needing 16 or 78 RPM in addition to the provided 33 and 45 RPM speeds: I may be able to modify the direct drive turtnable you need. For 78 RPM, likely the phono cartridge will need ot be upgraded with one for which 78 stylie are avaialbe. A Modified to 4 Speed turtnable (16,33, 45, 78 RPM) with the appropriate cartridge and stylie is typically in the $400 range. 1. MCS 6600 Driect Drive Turntable. 2. MCS 6602 Driect Drive Turntable. 3. 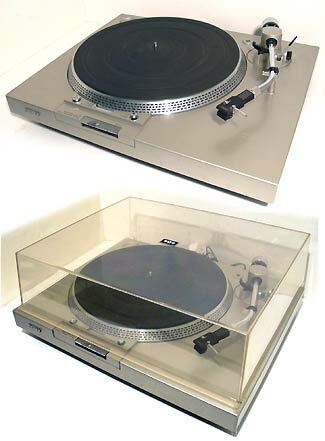 JVC JL-A40 Driect Drive Turntable (Comes with original box). 4. JVC L-A55 Driect Drive Turntable. --->>> Please refer to item nubers AND (!) the type of unit listed in picture ! EXAMPLE: #3 Direct Drive Turtnable. To mention: Likely any of these turtnables can be modified to play at 16 or 78 RPM as well. If needed inquire about that as well.